[UPDATE] SD Super Sneaky Pirate Room Escape is another point & click escape game developed by Selfdefiant for Melting-Mindz. 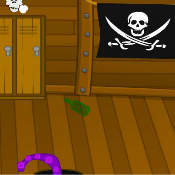 In this game, you volunteered to be a test subject for some extra money: they locked you inside of the Super Sneaky pirate room. The room is full of puzzles and hidden items. Look around and see what you can find to help you escape. Good luck and have fun! Directions clue on RH post but not working on locker dials. Turn your head to the right. They work on a 90 degree angle. For the six digits, pay attention to the positions of the numbers on the two strips. Number clue on bolts of wall. Stuck with a dull dagger, sword, map, and cannonball that looks like a bowling ball. The dull dagger is useful for something loose on the wall. Melody I don't see anything loose on the wall. Thanks Melody. I thought I'd been over every board. Now have cannonball and sword, need one more key. Out. Thanks for the wall hint. Finally found the wrench. Check areas you've already solved if they're active. A Bug: I was able to get out without using the hammer. I assume it was for the bottle. Just re-played. Got out without hammer, map, lighting candle, and opening Davey box. dont know if its a bug but key doesnt work on locker or door..
You need three silver keys. They go in a box upper right. Wrench was toughest for me. I needed to click several extra times on one of the chests. Pretty anti-climatic cannon scene LOL. Stuck with a key and map. I opened the box in the closet, but can't figure out the numbers for the chest lower left. Pairing top two (either way) doesn't work, nor does straight 3 (left) plus 3 (right), or vice versa. It's behind the chest in the lower right. If you click on it, it should move and reveal the wrench. Thank you Gail for that chest hint. That was a tough spot to find. Good game SD, thank you.